Our recipe for soft beer flatbread will not disappoint you. It might impress you. And it can deliver immense satisfaction, the kind that can only be obtained from warm, aromatic and tasty bread. If I had to make a guess, I would say that while you are grilling flatbread number two (out of 16 the recipe yields) you will simultaneously be devouring flatbread number one. Almost impossible to resist the urge. What Ingredients Do You Need for Soft Beer Flatbread? Simply yeast, beer, water, sugar, flour, salt and olive oil. And (highly recommended) some goat cheese, dates and caramelized onions to enjoy it with. Here is why. My urge to make soft beer flatbread tomorrow was sudden and overwhelming. It came to me while I was reading a book a few nights ago. I do recommend A History of the World in 6 Glasses by Tom Standage if you haven’t already read it. It takes you from the very first human settlements and the advent of the first civilized drink – beer, to modern day Coca-Cola and globalization. It is not a brand new book, first published in 2005 so the dominance of health consciousness marking the last decade is not discussed, just the rise of bottle water consumption (and how bottled water is frequently found to be of inferior quality to tap water). Regardless, it is a fascinating book and I am glad that I came across it, even if late. The opening chapter on beer tells the story of the ancient civilizations of Mesopotamia and Egypt where beer was used as form of payment, was the reason for the emergence of record keeping (writing) and people used to greet each other by saying “bread and beer”. ‘the standard issue of bread, beer, dates and onions, sometimes supplemented with meat or fish and with additional vegetables”. That was it. This one phrase triggered a mental image of indulging in a simple ‘standard issue’ meal of fresh bread, dates, onions and beer. Go figure. 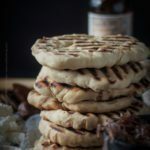 I also thought that the bread should definitely be flatbread and the onions could be caramelized and accompanied by some cheese – goat cheese. They did domesticate goats and sheep in those parts of the world and learned how to make cheese. Almost every country has their own flatbread heritage. 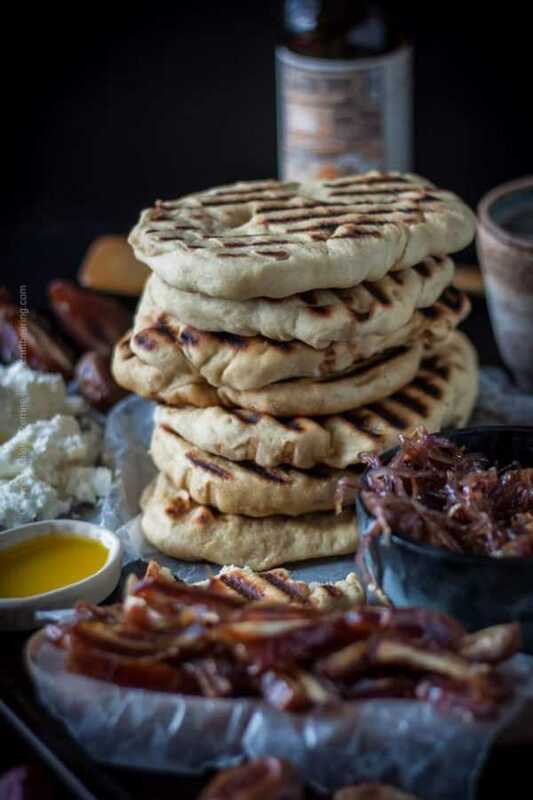 Sometimes the flatbread is soft, puffy and small – like pita or naan; sometimes it is crispy, thin and larger in size – like lavash and tortilla. Sometimes it is leavened with yeast, sometimes it is not. And of course there are hundreds of variations. I contemplated using a recipe for Bulgarian purlenki that I have from my grandmother. One of few recipes I have in her hand writing. She made them with beer. Purlenki are the version of flatbread Bulgarians make. They are soft and leavened with yeast. Except for the yeast is moist and is sold in little cubes. Not something I could buy here. So I asked Chris for help and he gave me a great recipe for grilled soft beer flatbread that yields one hundred and sixty pieces per batch. He uses it when people order the Mediterranean buffet for bigger events. I wanted to use a dark and sweet ale. There was no hopping thousands of years ago nor were there modern kilning methods. 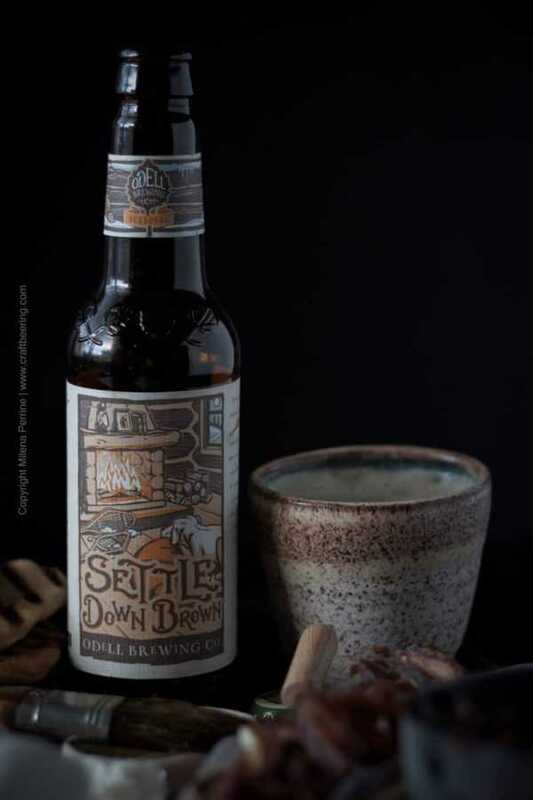 We had a seasonal brown ale at home, recently introduced by Odell Brewing and bearing the poetic name Settle Down Brown. Pleasure to drink by the fire at the end of a cold winter day, especially if you happen to have a wood burning fireplace. It is also a very attractive candidate to use in recipes, being sweet and malty. In partnership with the brown sugar in the recipe it gives the soft beer flatbread a darker color. I haven’t exactly studied the history of bread, but I am pretty sure that white bread is a very, very new phenomenon on its timeline. So as you choose a beer for yours – go with something that is closer to the original brews of mankind, the ales Ninkasi brewed. Definitely a strong malty backbone, perhaps dark fruit notes and most certainly toasty notes. Whatever the beer you choose for your flatbread, once you make it I assure you – this is a complete meal. Tear a piece of the soft beer flatbread while it is still warm. Brush a bit of olive oil on it, add a bit of goat cheese, some caramelized onions and a piece of date. Now on my radar is to make this awesome soft beer flatbread with sprouted wheat flour which is supposed to be more nutrient rich and easier to digest and see what happens. If the results are better than from using all purpose flour I will update this post or put together a new one. This soft beer flatbread is immensely enjoyable and requires just a little effort (unless you think of kneading as pleasure, then no effort). Grill outside or indoors using a stove top cast iron grill pan. Serve warm with olive oil for brushing, dates, caramelized onions and goat cheese. Pair with a malty brew. Begin by warming the beer (do not exceed 100℉). In the bowl of a stand up mixer fitted with the dough hook combine the yeast, brown sugar, warm water and warmed beer. Stir and let sit for 5-10 minutes. Once the yeast begins to foam up, in a separate bowl mix the flour with the salt. Add to the yeast & beer mixture and mix until the resulting dough separates from the sides of the mixing bowl and forms a ball. Prepare a clean, lightly floured surface and place the (should be slightly sticky) dough on top. Knead (to your heart's desire:) or for approximately 3 minutes, adding flour if needed. Shape the dough into a ball. Divide it into two. Continue dividing the dough into two until you end up with 16 small pieces. Shape them into small balls and flatten them into palm size rounds by pressing between your palms or laying them onto the working surface and pressing down with the knuckles of your fist. Arrange the flat rounds onto two quarter size baking sheets (8 per sheet) and brush them with olive oil so that they do not dry out on the surface. Cover well and let sit in a warm place for at least 40 minutes. Once they dough has risen about 1/3 over the original size and is very soft to the touch you can begin grilling the flatbread. Use medium heat on your grill or heat up a stove top cast iron grill pan over medium heat. Grill each side for about 2 minutes. Lightly brush each flatbread with olive oil once done and place in a basket lined with a cotton towel. Cover to keep warm. If making the caramelized onions, begin by slicing the onion very thin. (Do this while waiting for the flatbread to rise.) Over medium heat in a small pan mix it with the olive oil and the brown sugar and let cook until it is soft and begins to caramelize. Transfer to a serving bowl and keep covered until needed to avoid drying out. Another one to pin! Your photos are amazing! Thanks for sharing at the What’s for Dinner party! Hey milena….! 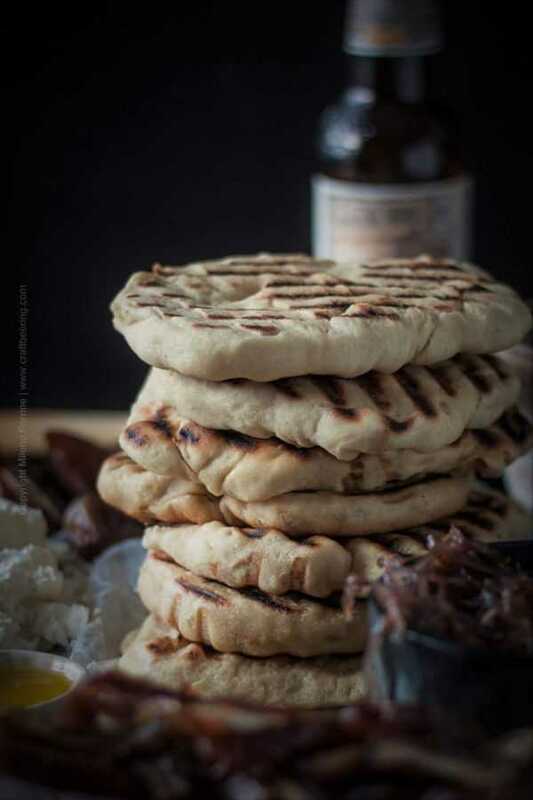 Your soft beer flatbread looks soooo good & yummy, I really enjoyed your recipe & I like your pictures as well. I will try to making this recipe from your recipe. Thanks for sharing…….! A good flatbread recipe is a must-have! I have tried a few, and am looking forward to trying this one out! Thank you, Alison! We do hope you try this recipe. YUM! Such a delicious combination of flavors here! But what doesn’t taste good on homemade grilled bread?! You’ve hit it out of the park…once again! I just pinned your awesome Flatbread and can’t wait to try it! Hope you are having a great day and thanks so much for sharing your awesome post with us at Full Plate Thursday. 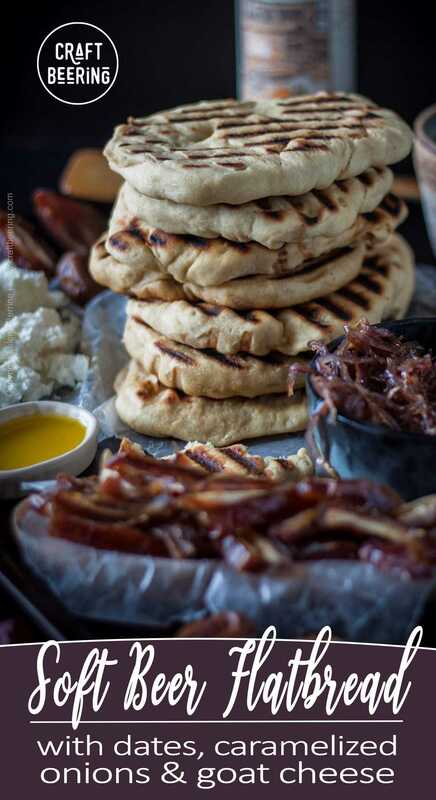 Your homemade flatbread with beer recipe looks amazing. What a great idea to serve with beer of course, when entertaining friends. Thank you for sharing your post at the #HomeMattersParty this week. i love goat’s cheese and these flavour combinations sound delicious. Thanks so much for sharing with us at #BloggersPitStop. What a coincidence that I read about Mesopotamia here 🙂 My first grader is learning about it now, but she missed the beer part!!! 😉 But you got it covered here! I love love homemade naan! 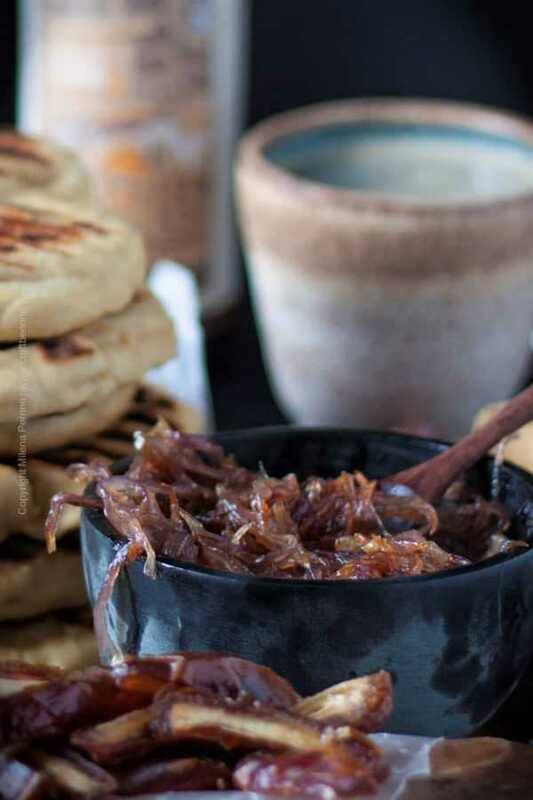 and I have serious weakness for caramelized onions! I can eat that thing on its own!! Beautiful photography too!! Haha, I can see how elementary schools would purposefully omit beer from history, lol. Caramelized onions are a bit of weakness of mine too:) Thank you, Marvellina! Another recipe for me to try. Love it! Thank you. Well I guess I would have been happy as a clam living in Mesopotamia. What more does a person need than bread, beer, and dates? And a little goat cheese too :). I have such fond memories of making flatbread with my grandma when I was little; I have her recipe but it never turns out like hers did. I’m going to try this one instead. It sounds AMAZING! Have a great weekend! Thank you, Kelsie! I am sure that if I made my grandma’s recipe it won’t taste as I remember. Sometimes I wonder if a persons’ energy while touching the dough doesn’t have an impact. Maybe my energy is not as good as hers was. I guess I’ll never know! 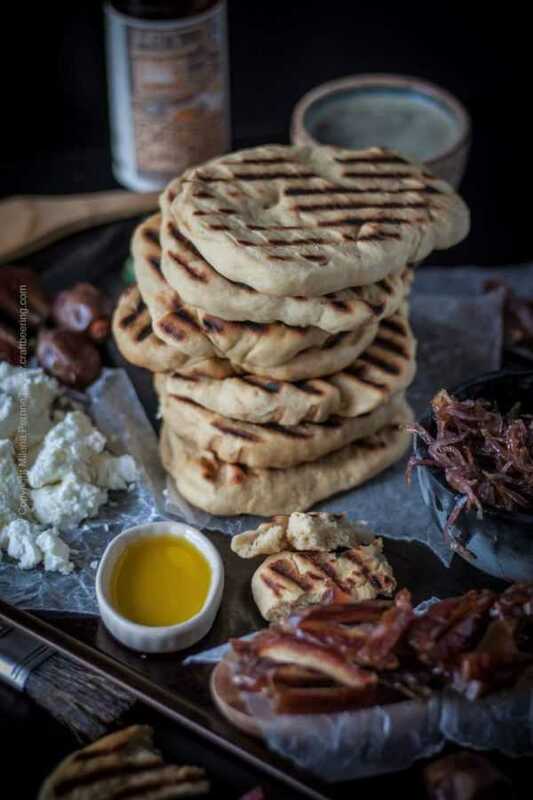 Ths is fantastic looking flatbread and the daily rations of bread and beer I think most men would be satisfied with that. Haha! As a woman I would be satisfied too:) No shortage of topping ideas for flatbread, right? Thank you so much, Leanna! Once again, your pics are stunning! 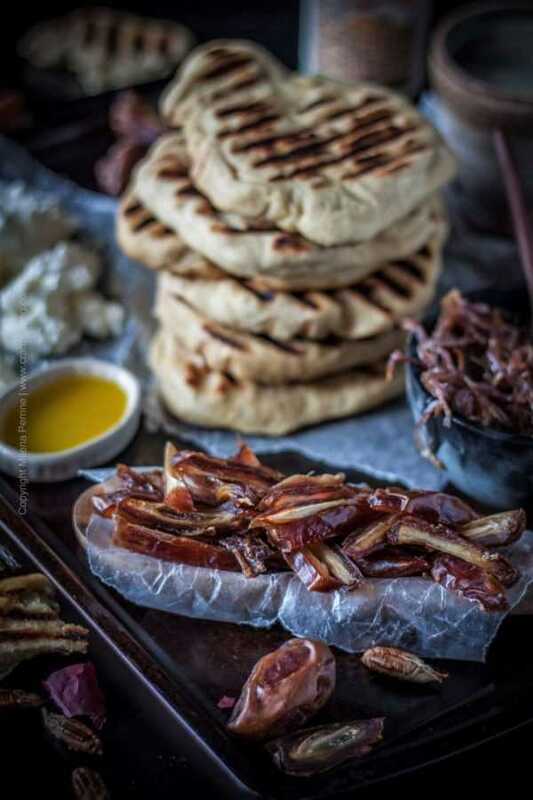 I would definitely have to have some of those yummy caramelized onions with these…and a beer. Funny thing, we don’t eat a lot of bread in our home either and usually when we have a loaf we have to freeze and take out a couple slices at a time so it doesn’t spoil. Having said that, I do LOVE bread! And these flatbreads need to happen. Imagine they would be lovely with a charcuterie platter. ‘Drinking’ your bread is not a bad idea either 😉 Pinned! Cheers to an awesome weekend! Thank you, Jennifer! Simple is best, isn’t it?